Jacob “True” Furrh, an environmental science and civil engineering major, and Rachel Sanchez-Ruffra, a biology major, were selected as recipients of Hollings Environmental Science Scholarships. Both are students in the University of Houston’s College of Natural Sciences and Mathematics. 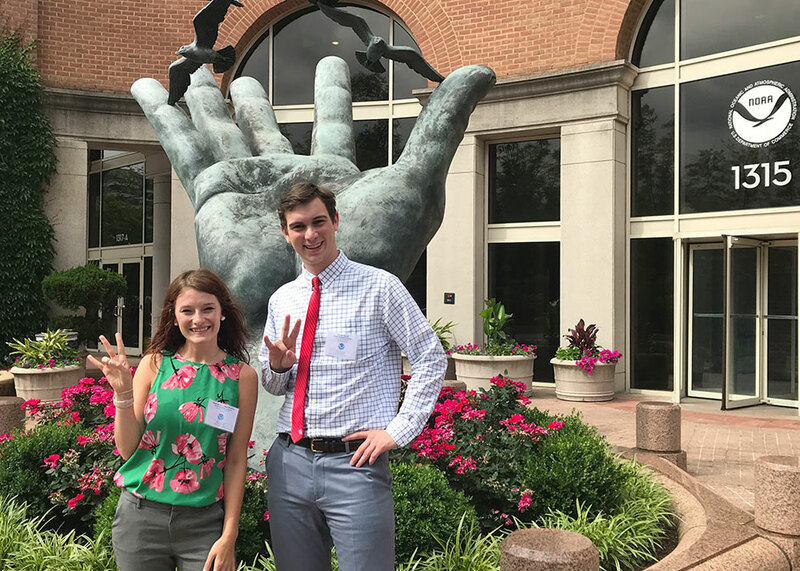 NSM Students Rachel Sanchez-Ruffra and Jacob “True” Furrh at the 2018 NOAA Undergraduate Scholars Orientation in Silver Spring, Maryland. The Hollings Scholarship, instituted in 2005, pays tribute to Senator Ernest Hollings of South Carolina, an advocate for ocean policy and conservation. The scholarship supports undergraduate education in the environmental sciences through scholarships and internships with the National Oceanic and Atmospheric Administration (NOAA). The scholarship, open to university sophomores, offers up to $9,500 in tuition per year for the junior and senior year, as well as a 10-week, paid internship at a NOAA facility during the summer. Furrh, a Tier One Scholar and member of the Honors College, is active in NSM Student Leadership, is a senior editor of the student-run journal Acta Mineralogica Houstonica, and spends weekends as a coordinator in UH CARES. Furrh participated in a UH study abroad to Iceland and completed a Summer Undergraduate Research Fellowship in 2017. These experiences heightened his interest in research into environmental issues. Through the NOAA Hollings Scholarship, he hopes to study coastal resiliency and how environmental stewardship can mitigate the effects of disasters. In 2017, Sanchez-Ruffra, also a member of the Honors College, participated in GalapaGO, a month-long, research-based study abroad experience in the Galápagos Islands organized by NSM. Through this experience, she developed an appreciation for ecological field research. She hopes to pursue a graduate degree and a career conducting research in environmental protection and preservation. By offering hands-on experience in environmental science, research, technology, policy, education, and management, internships with NOAA have a proven track record of launching successful careers in environmental science. NOAA reports that 75 percent of Hollings recipients go on to graduate school, and more than 7 percent have since received National Science Foundation Graduate Research Fellowships. Applicants to the Hollings Scholarship must be sophomores at the time of application and should have an interest in pursuing a career related to public service or oceanic and atmospheric research. The application for 2019 will be available on September 1.